The world we’re living in is already always connected, but it is still nothing compared with what is forecast: in 2022 it is estimated there will be more Internet traffic than in all past years put together and that 60% of the world population will be Internet users, compared with the 45% today. The demand for coverage is becoming increasingly a priority also on board yachts and superyachts. The new generation of sailors and boat owners today wants Internet on board for safety, for handling navigation and for pleasure. Inmarsat, a global supplier of mobile satellite communications, has two specific solutions for superyachts and medium-sized boats. They are Fleet Xpress and Fleet One. Fleet One was created to offer coverage solutions (global or coastal) for yachtsmen on boats between 40 and 70 feet. The system ensures coverage outside the VHF or GSM networks through the L-band satellite network (simultaneous voice and IP data at up to 100kbps) using the Inmarsat-4s, with over 99.9% average network availability. 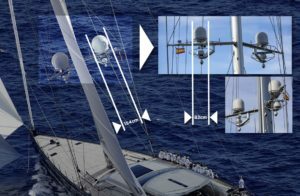 The strong points of this system are the compact antenna, easy to install on board (it weighs 3.9 kg and is 29.2 cm high and 27.6 in diameter), and integrated security services. Fleet One also guarantees telephone connections, email, access to Wi-Fi and navigation applications and has a free voice distress (505) call service always active for use in emergencies that puts the crew in contact with the nearest Search & Rescue team. From this year Fleet One will become one of the line-fit options offered by Beneteau, Lagoon and CNB. The communication package is available through Inmarsat partner Advanced Tracking and provides boat owners with a two-year package that features unlimited satellite communication with 4G for coastal cruising including 5GB/month broadband, through third party provider WeStream at high speeds via Wi-Fi in more than 130 countries. Yacht owners also get unlimited data, a voice package, 24/7 rescue access, medical assistance, automatic weather files reception, email & file transfer compression system and tracking via satellite. But if the demand for connection on medium-sized boats is growing, it is on superyachts that the highest technology and the biggest investments are concentrated. Just a few data give an idea. According to the results of the “Inmarsat Superyacht Connectivity Report” produced by The Superyacht Intelligence Agency, the average budget available for equipping a superyacht with a satellite communications system is about €250,000 with monthly spending on satellite data and voice of around €5000. The research confirms the growing demand from captains and crews for satellite-delivered bandwidth to optimise navigation, yacht management and the internet of things (IoT). And it highlights the main factors considered in choosing a satellite network, which were: connection speed (73%), Bandwidth (64%), Price (51%), Global coverage (46%), Customer support (38%), Flexibility of airtime contract (32%), Compatibility with onboard devices (32%), Antenna design (17%). The main uses of satellite networks on board were: ISM and yacht management (43%), Internet of things (IoT) (34%), Optimisation of navigation/routing for fuel economy etc. (27%), Remote monitoring/equipment service (23%), TVIP/Content streaming (23%). Inmarsat proposes for superyachts the Fleet Xpress system (which unlike Fleet One uses the Ka-Band). 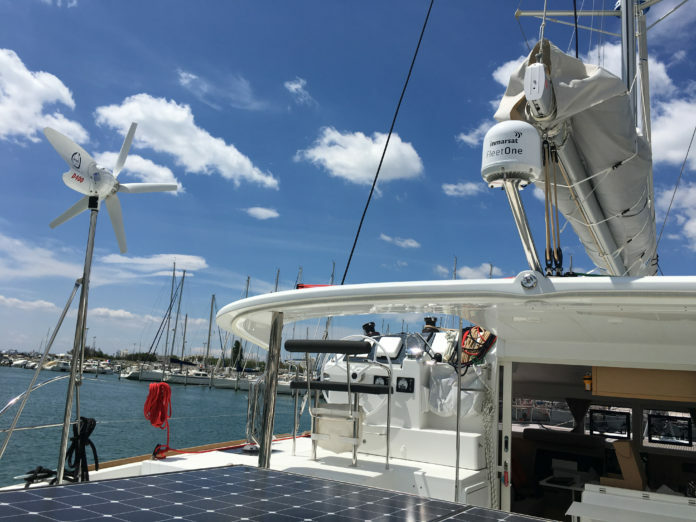 Recently the yacht Ganesha was equipped with a high-speed, high-quality Fleet Xpress Ka-band VSAT service, obtained with dual Cobham Sailor 60 GX antennas guaranteeing continuous global coverage. Ganesha is a sloop built by the Dutch yard Vitters, 150 feet overall, which is planning a round the world voyage. The unobtrusive antennas, measuring a mere 60cm, represent a light and compact means of accessing High Throughput Service (HTS) Fleet Xpress maritime broadband. The system has been installed through Inmarsat’s Tier 1 Value Added Reseller (VAR) e3 Systems. Ganesha utilises e3’s Hybrid solution which combines VSAT and 4G data to deliver uninterrupted connectivity at all times, as well as enabling vessels to manage and monitor other factors including IPTV and cyber security. Considering the demanding voyage planned for Ganesha, the choice of the double Fleet Xpress antenna came from the need to have guaranteed global bandwidth, and the combination of Inmarsat’s high-speed Ka-band technology and dependable L-band FleetBroadband backup – reinforced with automatic switching between the two antennas – overcomes the threat of line-of-sight signal outages caused by rig and sails. In addition the replacement of the Ku-band antennas that were present on Ganesha with the Ka-band 60 GX led to a saving of 200 kg on the rig, with consequent improvement of performance as well as a smaller impact in aesthetic terms. Not least, in the decision to install the system the possibility of delivering premium-quality IPTV (internet protocol television) streaming was considered – a major asset for the recreation and practical aid of guests and crew alike, anywhere in the world.